Manda from Florida made and submitted this beautiful homemade baby shower centerpiece. 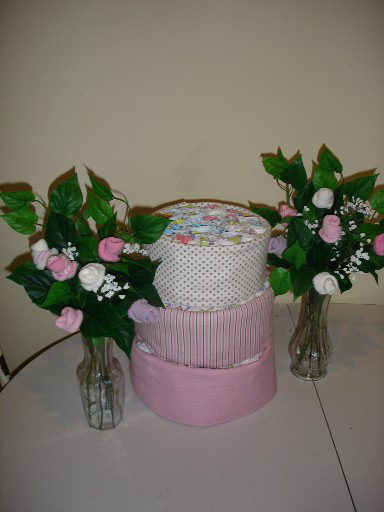 She made a lovely arrangement of 2 baby sock bouquets on either side of a diaper cake. It turned out wonderfully! I love that she used 2 baby sock bouquets - what a great idea! 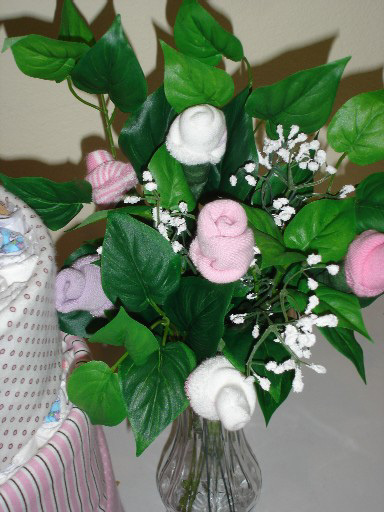 And her baby sock rose bouquets look so real! Thank you SO much, Manda, for "paying it forward" & sharing your cute ideas and photos with the rest of us!!! Hi! I followed your instructions for the rose bouquet. I was a little worried b/c I wasn't sure if I could follow it without actually having someone show me how. But your instructions were so crystal clear! Thank you for your help. Your entire website is a wonderful asset for planning a babyshower! Thank you for the work you put into it.